Ah! Is anyone else as excited for this book as I am? I love Kendare Blake, and I really enjoyed Three Dark Crowns. 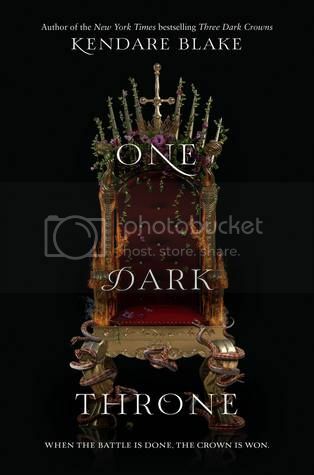 I'm super excited to see what's going to happen next in One Dark Throne! Yes!!! I loved the first book and I right there on the bench next to you waiting for this one. Great pick! I want to read this one too! While I really struggled with the first book I'm hoping this ends (bc it's a duology right?) on a higher note! I very excited for this book too. I just can't wait to know what happens next -who is going to become the Queen?! Kendare Blake gets a lot of love on blogs and booktube so I'm sure you'll love this one as much as the first. I love how the covers of both tie in and am grateful they didn't do a cover change. Sadly I didn't like book one so I'm pretty sure I won't be reading book two! I want all the spoilers though, so I'm depending on one of you fans. :D I hope you enjoy this book when you get the chance to read it! One Dark Throne is fantastic and even better than the first. Love, Loyalty, betrayal, battles, romance and politics. This book has so much you will never see coming. This is a must read for fans of all genres but especially fantasy fans.